We have now had Canyon for almost 4 weeks and he has learned so much. He can sit and lie down on command, unless of course he isn’t interested in listening – which seems to be a theme in this house!! His house training is coming along, he has begun to sit at the door when he needs out – we are going on day 3 of no accidents!! Our other dogs are still getting used to him. Phoenix ignores him for the most part, but Cessna enjoys wrestling and running around with him outside. Aspen gets along with him most of the time, but there are those odd moments when Canyon decides to bark at her, which causes stress…hopefully this behaviour will stop soon. On another note, we finally got a new vehicle! 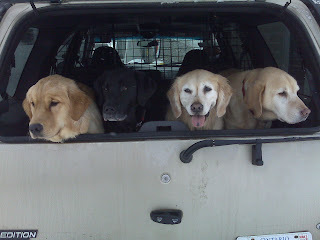 We got a 2000 Ford Expedition and the dogs are absolutely loving all the space. We got it on Saturday and have already set up the back for ultimate doggie comfort by removing the very back bench and putting down foam along with a blanket. In order to keep them safe and keep the passengers from complaining about dog hair, we bought a barrier which goes along the back of the seats and blocks the dogs from jumping up front. We had them out for a test drive yesterday and from the picture we took, I think you’d agree that they are loving their new ride! Before I sign off, here’s a quick update on Reece. He’s almost been adopted, the potential family is just doing some last minute research on his elbow issue in order to make sure that they will be able to meet his needs in the future. I am really excited about this possible home because we will get to see him often and maybe even dog sit sometimes  I know it has taken a long time for a home to be found, but if this one goes through then I think the wait was worth it. Good luck Reecey Piecey, Mommy misses you and hopes to see you really soon. I have avoided seeing him thus far, so that he does not get confused as to why we are not taking him home. I want him to be well bonded to his family before we begin visiting – thus lessening the stress on both him and I. It would be too heart breaking to see him and then leave him again knowing he still doesn’t have a forever home.